If you are a Quatchi-lover (like me... and not in gross way - get your minds out of the gutter)... you HAVE to (as in click on the link RIGHT NOW!) check out the Quatchi Kid. Is it wrong that I want to take this kid home in my pocket?? 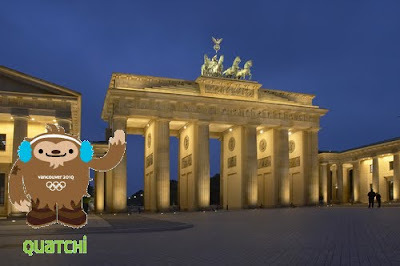 If you know of great Quatchi blogs/websites/fan pages let me know... there are still lots of Olympics left for me to post them for the world to see! The last ones have been SO HARD.. I'm still looking for pics of them. Maybe I would be doing better if I had travelled. geez... these are all so hard.... this looks like somewhere in Italy to me but i really dont have a clue. Have you got yourself one of those Quatchi hats? They are super cute.. especially on little kids. Thanks for linking to the Quatchi Kid!!! !